Show off your gorgeous pet in these fashionable silk, embroidered and mirrored jacquard woven trim collars available in the Classy collection. 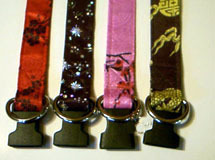 Every collar is finished with quality nickel plated or brass hardware. These are available in various sizes.